The city of Philadelphia has been swarmed by Stones fans from all over USA, as well as from other parts of the world. With easy access near New York City and other major hubs, close to the US tour finish for this time around, and with a pair of shows in the same city, this was the perfect match for many. I came down from the Boston show on Saturday, and has been staying at the next door Holiday Inn Stadium for a week. The Phillies have had four home games during this week, and every time there is a Phillies game, the bar is serving draft beers at $2. Quite a deal. So we have been a fine mix of Stones fans, Phillies fans and some odd tourists and travellers out here in "Stadium land". Also, the tailgating factor has been high. Tonight the first parties rigged up shortly after noon, with all the signs you can have, like one said "Exile on Broad Street". The atmosphere was set long time before the show started, probably long time before show day. I met fans and friends from Japan, England, France, Switzerland, Germany, as well as US "locals" from so many states including Jersey of course, New York, Florida, Georgia, Ohio and a bunch of other states, including home town Phillies of course. Pierre and the rest of the stage crew got very busy like 5-10 minutes before they were supposed to be on stage. Lots of preparations going on behind Charlie's drum set, but at 8:56pm sharp they were on with "Get Off Of My Cloud". The roar from the opening video just got louder and louder, Mick worked the stage, the band performed well, and the crowd were on from the very start. The next three IORR, PIB and GS went great, love every bit of them, and could not see any other songs replacing ths set of four opening songs. Under The Boardwalk (with Aaron Neville) ... what can I say ... I just stood paralyzed, like the band. Nobody moved. 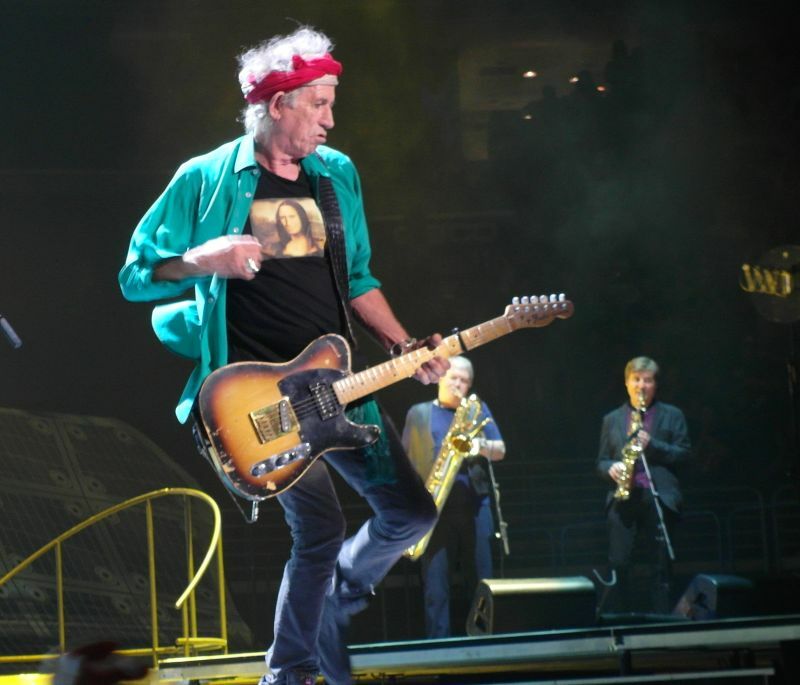 Just watch the video here, and you will see how Keith is all set just behind Mick and Aaron Neville, smiling at times, playing concentrated, like the rest of the band, Mick and his guest working some great vocals, true to the original the Stones recorded mid 60's. Aaron Neville singing with such a soft voice, not brutal, just gentle and perfect match with Mick. That was like hitting the jackpot. You go to many shows, and there, right there it was. Just like Witchitas Linesman in Witchita, or Might As Well Get Juiced at the Garden in NYC 1998. Boardwalk! Now! Right here! I just have to quote this from Wikipedia about Aaron Neville - one of the best matching guests I have seen on stage with The Rolling Stones ever! "Aaron Neville (born January 24, 1941, New Orleans, Louisiana, United States) is an American R&B and soul singer and musician. He has had four top-20 hits in the United States (including three that went to number one on Billboard's adult contemporary chart and one that went to number one on the R&B chart) along with four platinum-certified albums. He has also recorded with his brothers Art, Charles and Cyril as The Neville Brothers and is the father of singer/keyboards player Ivan Neville. Of mixed African American and Native American heritage, his music also features Cajun and Creole influences." On with the show... Then four more great songs to keep the pace up, I know they all well by now, even if Whip is not played that often. ER, DG and SHOT, all great, funky, sweaty, crowd moving joy. This crowd did not go for beers, certainly not where I was. Can't You Hear Me Knocking (with Mick Taylor) ... My hearbeat had just settled following Boardwalk, when I was in for another crown jewel! Mick Taylor on stage. Great sax solo by Bobby Keys. Mick Taylor owning the stage in his own world of this great, great song. It was then I realized... Play this song at every show! The crowd roar just grew as the song grew. By the time Mick Taylor went into the highlight of his guitar solo, it was like sitting in a jumbojet just taking off. We were flying, the show had taken off into a lace where you wish the song and the show will never end. The rest of the show was kept at the same hig level. Mick has never been more involved with the band on this tour. He was singing facing Charlie at times. He was behind Charlie on Can't You Hear Me Knocking doing the maracas. He was forgetting about the crowd for some great moments which told me he was enjoying the night as much as us. Not just as a performer doing his job for the crowd, but also as a band member highly into the band itself, like you can see often with Mick Taylor... Or Charlie... Keith did several quick walks through the extended stage tongue, so did Ronnie and certainly Mick. The show ended at 11:28pm, lasting for more than two and a half hours. As we walked out into the warm Philly night, fans around me talked about 72, 75, 89 and so on. Great numbers for US Stones fans, great tours, great years, great memories. Now we can talk about 13 as well. And the good news for Stones fans across the world are yes, they will do more after a break of three months or so, more more more, no worries, even Europe as it seems! This was by far the longest concert for us on this tour. Happy that we got 22 Songs back. Absolutely crazy with "under the Boardwalk" and "When The Whip Comes Down". We loved "Can't You Hear Me Knocking". It was already good with Roonie?s Guitarplay during Licks. But this was outstanding what Taylor gave us this night. Also "Midnight Rambler" was fantastic. Great concert and well worth to go back to US for the last 2 Shows. 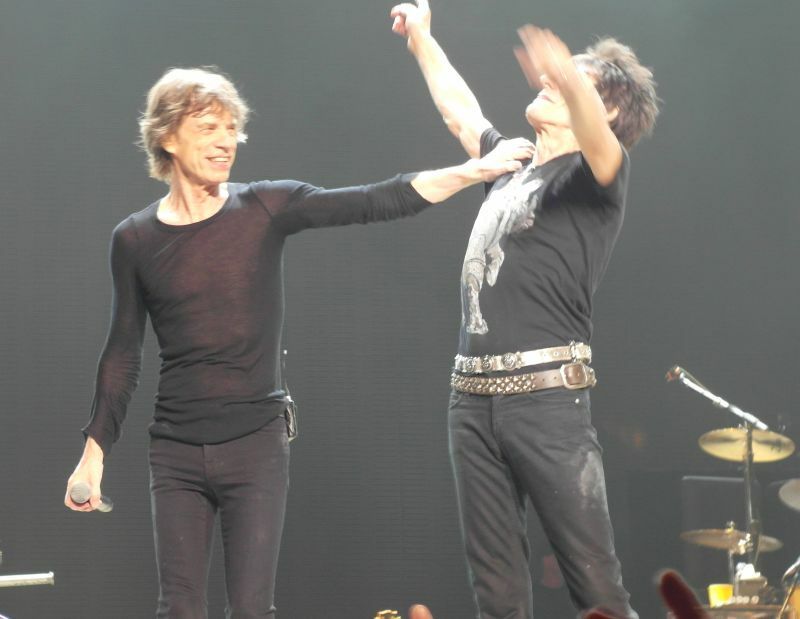 Mick Jagger thanked the audience for being especially supportive of the band on every visit to Philadelphia since 1965, a city they chose to launch many tours from. Ticket sales are always strong here. After over 2 and a half hours of playing, the youngster Ronnie is the only one who looked tired. The excitement level was very high in the crowd as the show began. I was not used to seeing a third of the audience recording songs on iphones. the stage loop walkway almost to the middle of the floor was a great idea, as mick and Keith made numerous strolls to the middle of the crowd to the point where their presense a few feet away became familiar. You can see them "rock out" on many songs, throwing a party with Brown Sugar, etc, but on a few as above the performance became truly transcendant and the decades evaporated as you could see mick/keith/charlie slip into a place none of us go. Lots of great songs, super JJ flash, and satisfaction played almost exactly like the original recording was a treat. 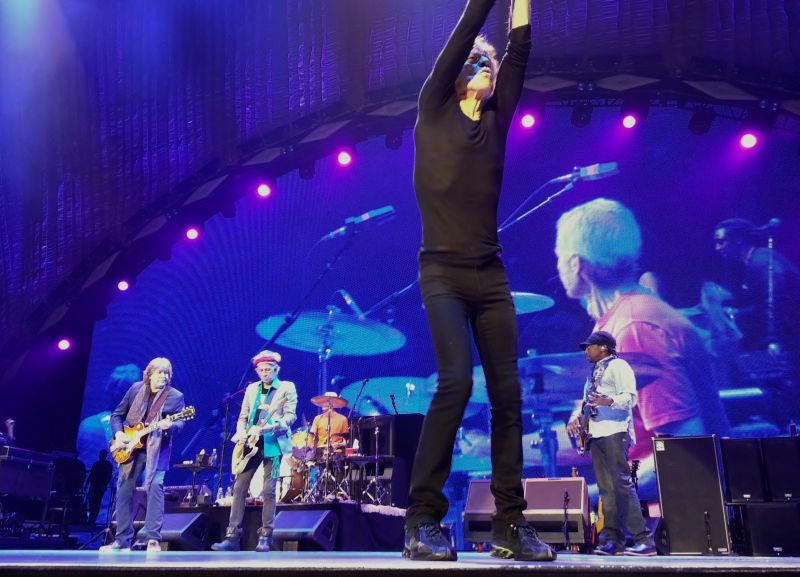 After 2 and a half hours Charlie did not seem to want to stop as he started playing the last song again and they replayed the first third of satisfaction, ending with keith replaying the opening riff with his thumb after throwing his pick. Sometimes its really hard to let go. 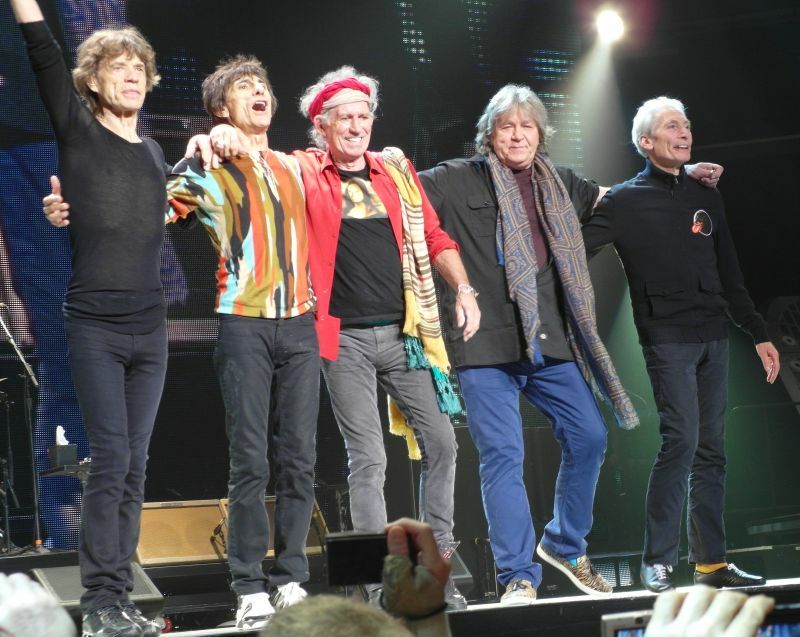 Just as I went in to the 3 Chicago shows earlier this month wondering if the Stones could top how they played in Newark in December I was wondering if the Stones were really even better, based on what I heard from those who attended the Toronto and Philly 1 shows. One knows not to question the possibility. They were even better at Philly 2!! Not to mention a set list containing my personal top 4 favorite Stones songs ever!! The packed and enthusiastic crowd all got the delight for nearly 2 1/2 hours complete with special moments and a few songs that each would have been the biggest highlight on other nights. Next, as usual, came Gimme Shelter, but this was another of the major highlights of the evening. This version went probably two minutes longer than usual. They kept extending the guitar parts in between, and Lisa Fischer was absolutely on fire for her part, even better than usual. Mick just kind of stood back and let Keith lead the way on some extended and excellent guitar work. Easily one of the greatest versions of GS ever. And then, it was guest time. With Aaron Neville as the guest, we figured the emphasis would be on the music and not some "star" mugging for photo opps and there to generate publicity. Sure enough, he came out for "Under The Boardwalk", which is supposedly the first time the Stones performed it live since 1965, and likely the last. Yet, they played it, with nice vocals by Neville, as if they played it every show for all these years. A nice treat for what was the only mellow song of the evening. Next came When The Whip Comes Down, a tremendous surprise. First time I'd seen it live since the Licks tour and this version was superb. I think it was their best version since the '78 tour. The Licks version was too fast (in terms of being true to the song) and this version was a more true version to one of my biggest favorites ever. Mick even played guitar through the whole song, instead of his usual play a couple of chords for the first verse and then take off the guitar, and he played it "seriously". Of course, it helps that Whip is also one of Mick's favorite Stones songs too. Mick was so energized that during Emotional Rescue he used his falsetto voice for the first two verses, something he hasn't always done. Again, a treat to see, making us wonder how they never did it live for all these years until now. Once we got Doom & Gloom and One More Shot we knew that we'd get Can't You Hear Me Knockin' after. They had not announced the vote winner, on which it was included, and when they have done Knockin' it has followed those songs. Sure enough, we got it. Another fantastic performance with Mick Taylor out on stage to nail his part, and add even more flavor. Early on, Taylor was given his 30 seconds or whatever, and now Keith, Mick J, and the others step back and let him go, and we got a special treat on this one. Even though Mick J did not use the harmonica at all on this. By the time Keith finished his set with another excellent You Got The Silver, followed by Happy, the show was already so great that I thought it was possible that for once, Midnight Rambler could face a challenge for being my biggest highlight of the night. But, of course, this is the Stones, so if anyone can raise the bar even higher, it would happen. And it did. Another amazing Midnight Rambler with the extra guitar jams throughout. The pumped up crowd singing along in the middle part seemed to charge up the band even more. We could tell they needed a quick breather after that one before getting into another solid version of Miss You. From there, on with the regulars. The fact that I even grooved to Start Me Up shows how much everybody was into it and having a great time. It was probably best summed up after the show ended and we went to look for some friends seated a section over to meet up in the concourse. Couldn't find them. Went back inside and found them all still in their seats. They needed to rest up from such a great show! Going to DC on Monday for the final scheduled U.S. show, but after this one in Philly, it's already worth the trip! This was a great show. There was high energy from when they started Get Off Of My Cloud. 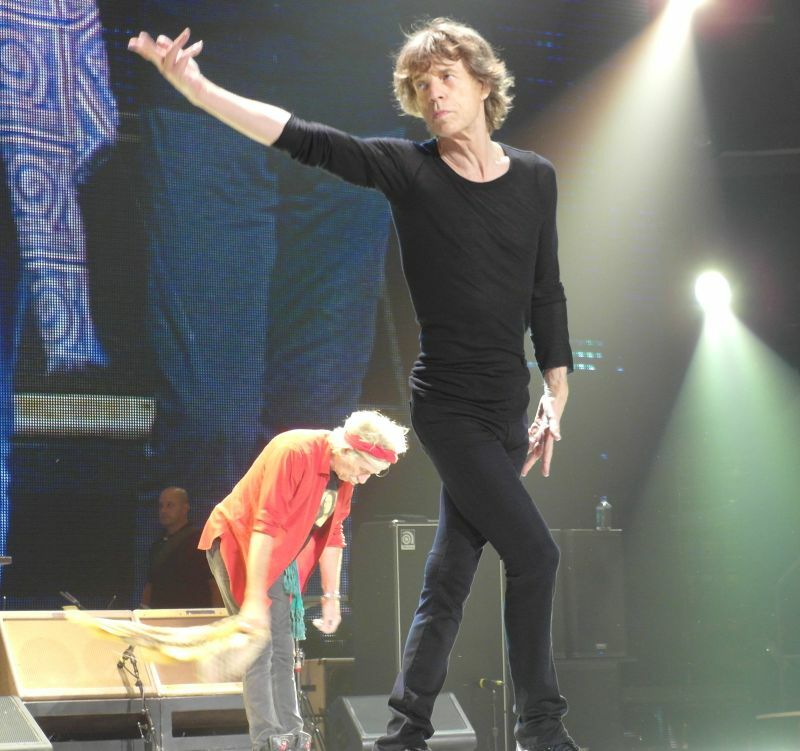 Mick prancing around finger pointing at the crowd in front. Keith was on tonight. Noticeable from the first chord of Its Only Rock N Roll (but I like it). Paint it Black is great live and we got a version which was extended a bit more than Tuesday nights version. Gimmie Shelter also got a little extended play. Lisa nailed it. Keith had great sound tonight far better than the first show. It did seem to go on a little to long and dropped at the end. For the guest appearance we got Aaron Neville on Under the Boardwalk. Honestly I had expected this to be a let down but I must say it exceeded my expectations. It sounded very well although Neville's microphone went flat a few times. I'll have to watch the videos but I think this was better than any of the bubble gum singers that have appeared with them. When the Whip Comes Down was great. Just rocking start to finish. At this point I knew we were getting the rockin set instead of the slower songs like on Tuesday. Emotional Rescue just didn't do much for me. I think they should change this one. This is one I just don't feel they have down right. It seems to lose the crowd on this song as well at least from my viewpoint the crowd wasn't as enthusiastic as on the higher tempo songs. Both new songs were done excellent and they are starting to grow on me. Doom and Gloom and One More Short are getting more of a response now than a few weeks ago. Finally, again we got Mick Taylor on Cant You Hear Me Knocking and it was one of the highlights of the show. He adds great dynamics to the band and this was one version they all just nailed. I could have watched them play this same song over and over the whole night. Great guitars start to finish. They need to tone Chuck down on Honky Tonk Woman. The song drags on to long and this piano is a bit of an overkill. Its still a great song to sing along with. Keith's set was great. He doesn't play as much on You Got the Silver as I would like to see but Ronnie is the key to this song. He is so focused and plays like the guitar is an extension of his arm instead of a musical instrument. This was also a great version of Happy. Keith didn't give us much of a solo but Ronnie was incredible. Ronnie made this song even though Keith was in the spotlight. Keith needs a longer solo. He seems to be in the spotlight but not in the lead on these two. Next another highlight. Mick Taylor on Midnight Rambler. Unbelievable. Just unbelievable. The entire band was in top form for this one. It was perfect and could have gone on and on. Miss You is to long. They need to cut about a minute out of this one. I guess they need to drag it on to get around the stage extension. It seems to lose its punch towards the end. I'd much prefer the 78 & 81 versions over the longer versions we get nowadays. Keith nailed the intro to Start Me Up. What a great lick! It sounded perfect. Crisp and clear. From this point on it just got better and better. I'd like to see Street Fighting Man instead of Tumbling Dice every other night. Mick lost his microphone for parts of Brown Sugar but this is still one of the classics. Its being played at the right tempo and its not getting dragged out to long. Bernard and Lisa stepped up on this one to keep it on track. WOOOOOO WOOOOOOOOOOO. WOOOOOOOOO WOOOOOOOO. Keith did a great job on this one. It sounded out of key at that end but his solo was one to remember. He was cranking. Good sound, great performance. He was smiling when he walked past the pit you could feel the energy coming off him. Even the second time around there was a radiant feeling when he walked by. Happy, smiling and doing what he does best! Chorus takes You Cant Always Get What You Want to a new level. They should have done this years ago. Just this little extra takes this to the top. 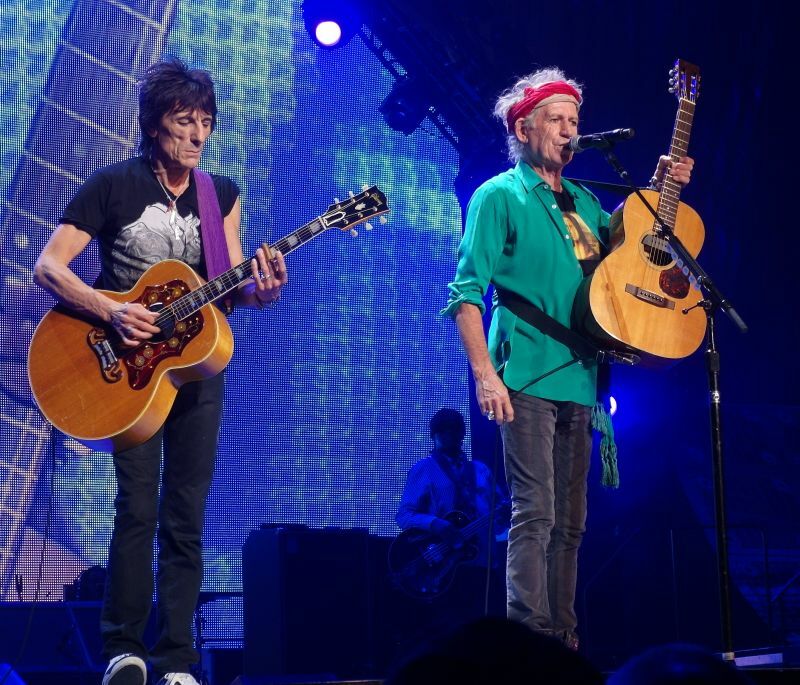 When Mick and Keith walk out with guitars in hand the song has already taken off. They just add to the momentum and take it over the top. 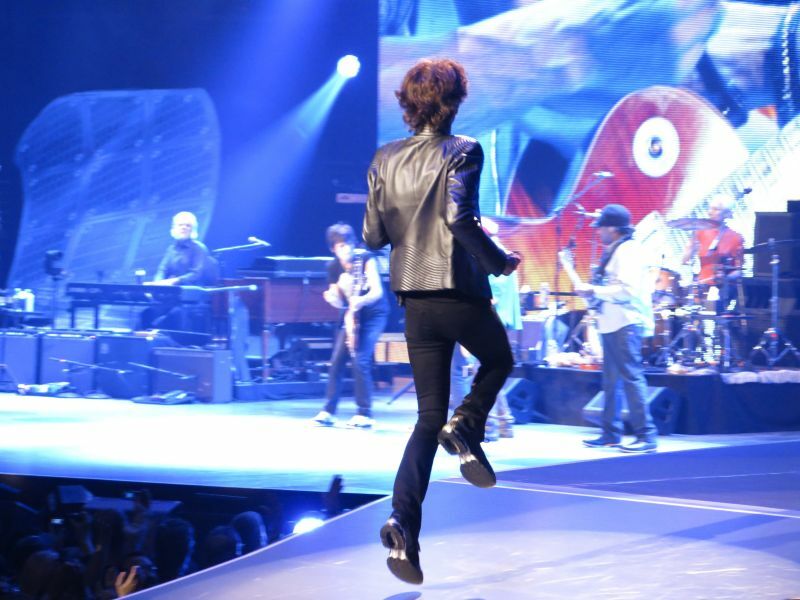 Jumping Jack Flash. What else can I say. Its Jumping Jack Flash! Satisfaction is a great closer. We got Mick Taylor for a third song and that brought Satisfaction to all of us. This show was more energetic and enthusiastic than the Tuesday show. There was a feeling that was missing on Tuesday. Overall I would rate this one of the better shows I have seen on the tour. It was a much different feeling than in Chicago. We can only hope the energy continues to Washington DC on Monday. 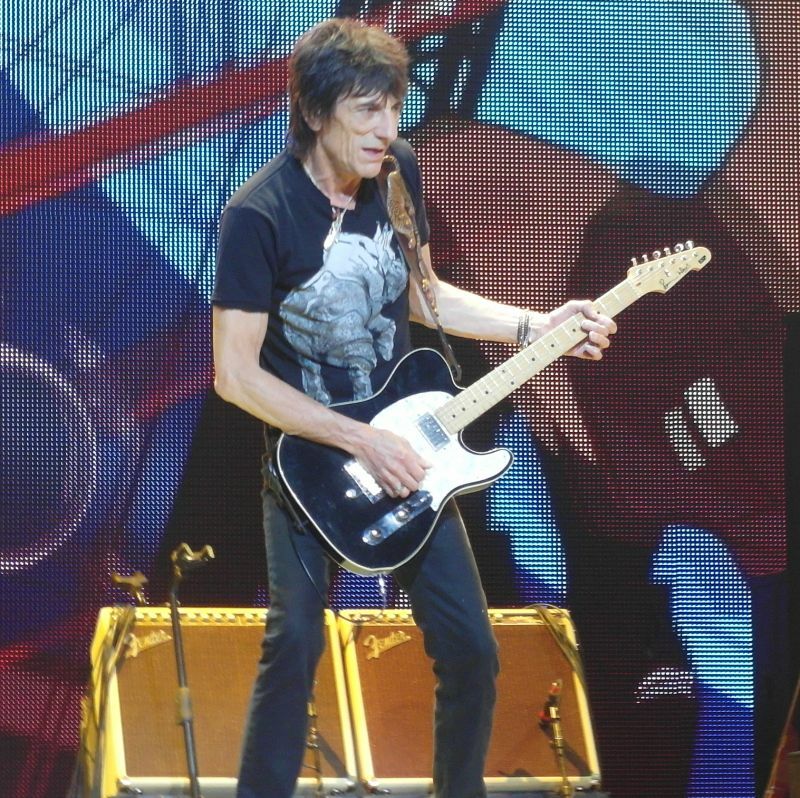 Even after having the privilege of seeing the three Stones shows in my hometown of Chicago a few weeks ago, I have to say that last night�s second Philadelphia show was stronger than any of them (even number 2 on May 31). 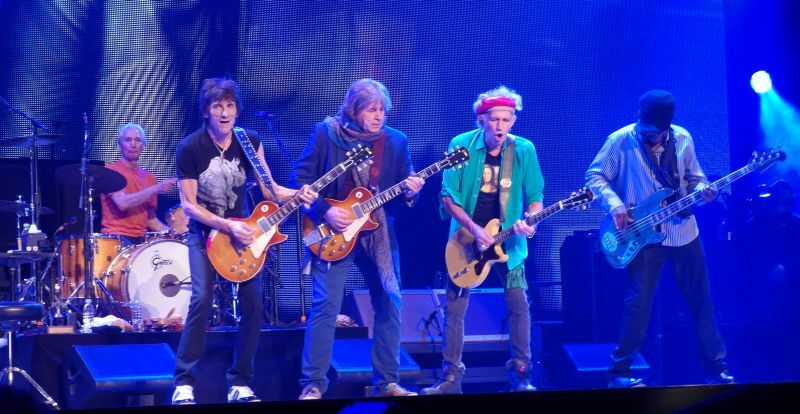 Philly is definitely a Stones town. I felt this in 2002 when here for the Tower Theatre show and felt it again this time around. 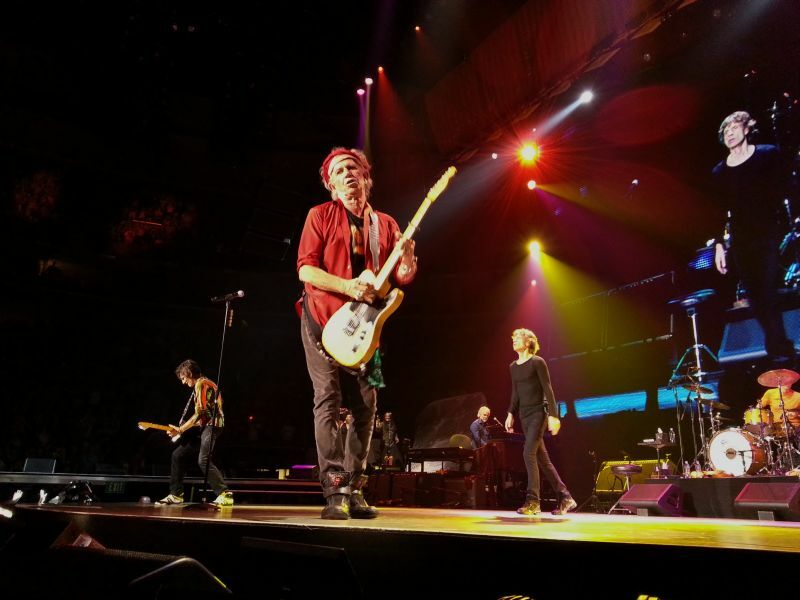 From WMMR�s comprehensive coverage to Mayor Nutter�s proclamation of "Rolling Stones Week" to the fans in and around the Wells Fargo Center, it�s clear that the City of Brotherly Love loves for the Rolling Stones. To echo other reviewers, the band was totally "on" and this was apparent right out of the gate with Get Off Of My Cloud. Throughout the night, there were numerous examples of the band giving more; they were like those kids in school always going for extra credit. This was particularly evident on the extended Gimmie Shelter, the longest version I can ever remember hearing live. I didn't think it would ever end ... and didn't want it to! When the show ended at 1130 pm, we all knew the band had left everything they had on the stage. 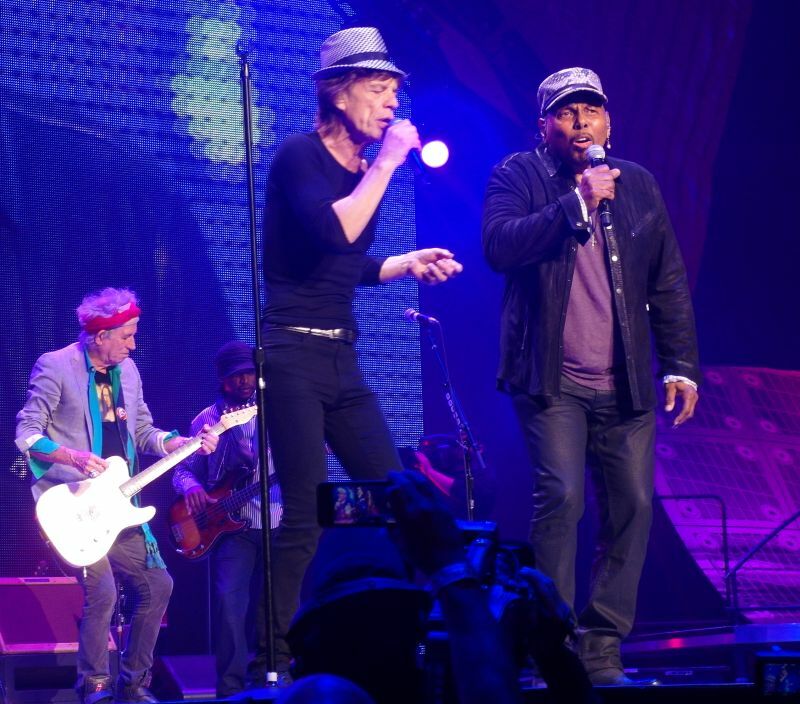 While I don't know a lot about Aaron Neville, it was very obvious that the Stones have great reverence for him. This was clear in the wonderful rendition of "Under The Boardwalk" as well as in Keith's comments before his set. 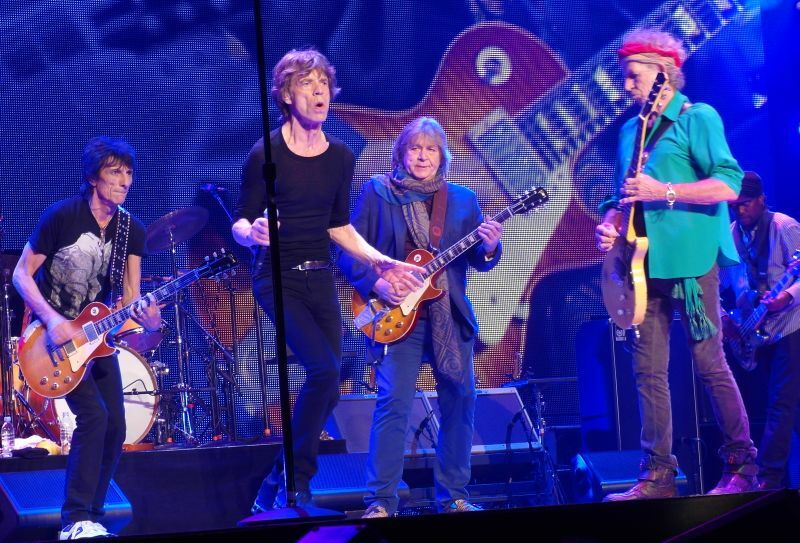 This truly made Mr. Neville a "special" guest, worthy of sharing the stage with the Stones. CYHMK was as great as the version at Chicago 2, probably a little better. 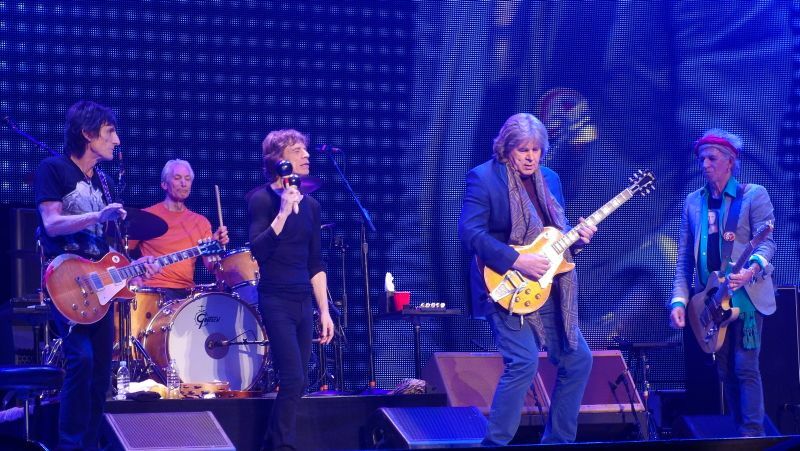 The "extra credit" was poured into this number and Mick Taylor again showed what a valuable addition he is to this tour. Midnight Rambler is always a highlight and this rendition was no exception. Fantastic all around effort from the band. ... but I said that after Chicago 2. Throughout the show, the band ripped through a rock oriented set, palying only one ballad, �You got the silver.� First and foremost, Mick Jahher is in top form. Not only was he as energetic as always, strutting and sassing it up on stage, but his voice has improved since the 2005 shows. Mick�s voice dropped considerably in the 1980�s and now it seems that he�s finally mastered his thicker voice. While his deeper voice has more Chicago blues rumble, he has now extended the sense of dynamics and feeling in his voice, so that on songs like �Gimme shelter� the desperate howl was as sensitive as it was when originally recorded. 1. Funnily enough, some of those critics have been waiting since 1976, suggesting that they themselves, are too old. 3. Except drummer Charlie Watts- Charlie Watts NEVER smiles. 4. Jenn Platinum and I got the special �RS.Com� $85 tickets, but somehow, we ended up REALLY close to the stage. It ruled. 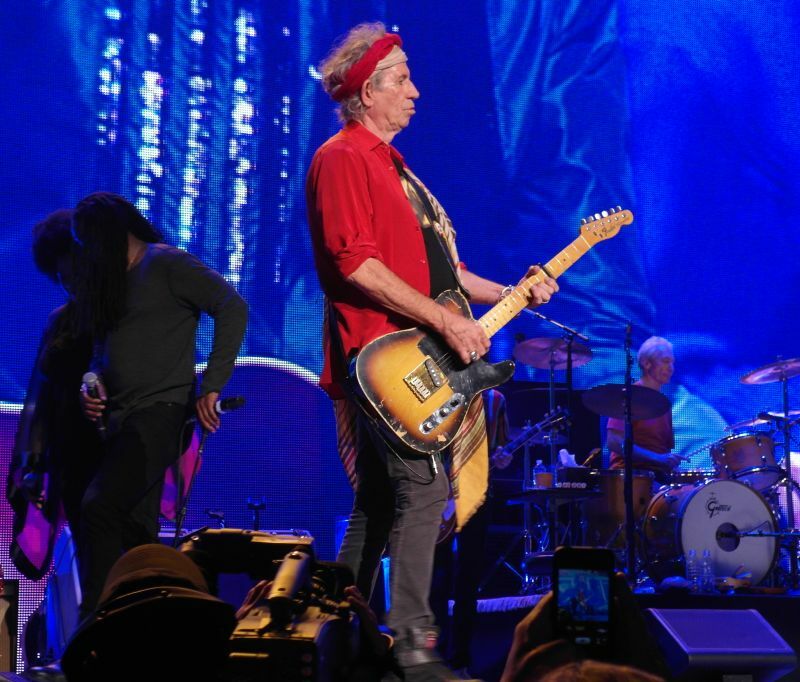 I thought it would be difficult for the Rolling Stones to top the first Boston show for best of the tour, but Friday night in Philadelphia set a new standard. There were two major factors to makes this so. First, Keith was having a better than usual night, confidently and calmly complimenting Mick Jagger while organizing the rest of the band. I would rank Keith's performance slightly below the five or so times I have seen him absolutely on fire where he seems to astound his band mates as well as the crowd, but his playing was close to the best ever. Secondly, Mick Taylor's playing was the best I had ever seen (including solo performances), and Can't You Hear Me Knocking was a song performance for the ages. If one had to put forth a single song to argue why the Rolling Stones are indeed the greatest band of all time, this would be a good choice. Taylor and Richards showed a depth and creativity of their guitar interplay, and Bobby Key's sax matched them, to create a haunting jazz like trance superior to the recorded version. Confident is the best single word to describe Mick Taylor tonight; at other points on the tour, he seemed a bit uncomfortable or just happy to be on stage with the Stones. Tonight he had a presence of being THE man, with a brilliant sound that had even Keith Richards smiling with reverence. And it was very different than seeing old films of the Stones with Taylor in the seventies, where he performed his craft without much show of personality or acknowledgment of other band members. This is the first time Taylor really did seem to be an equal to the other Stones, and it raised the band to a level I had never seen in the thirty five years I have been seeing them. And much credit to Mick Jagger for picking up maracas and just blending in with the instrumental, rather than being a focal point or distraction as he can be on other songs. Taylor's presence carried over nicely to Midnight Rambler: I had thought this song could not get any better and more drawn out than it did in Boston, but with Taylor's guitar and Jagger's harmonica facing off, Ronnie dead serious and showing he is as good as any blues man that ever stepped on stage, and Keith, well, just being Keith it was another example that this band is really playing better than it ever has. I don't see any reason why this level of performance cannot continue through to Glastonbury, and I pray that they keep the cameras rolling so there is some record of something like what the fans in Philadelphia witnessed on Friday night. Yes, Martin Scorsese is a great director, but what is captured in the film in the movie Shine A Light pales in comparison to what was going on in Philadelphia tonight. Aaron Neville's guest performance was a very pleasant surprise, helped largely by the song selection of Under the Boardwalk. This had a great nostalgic feel, seeing that the Stones released this song as a single back in January 1965. Also, Neville is the oldest guest on the tour so far, having turned seventy two in January. Like the Stones, he certainly seems younger than his actual age. Mick Jagger wore a black and white fedora for his duet with Neville, which was unusual as he would wear it only for the opening number at other shows. He kept it on for a rocking version of When the Whip Comes Down, whose hardness nicely balanced the more mellow and jazz tinged parts of the middle of the set. Seeing Mick in a hat, thrashing away on a guitar side by side with Keith and Ronnie created a delightfully crazy garage rock atmosphere in Wells Fargo arena. The sartorial statement lasted through the bouncy 2013 staple Emotional Rescue, whose conclusion was punctuated by Jagger jettisoning the fedora on the final beat. 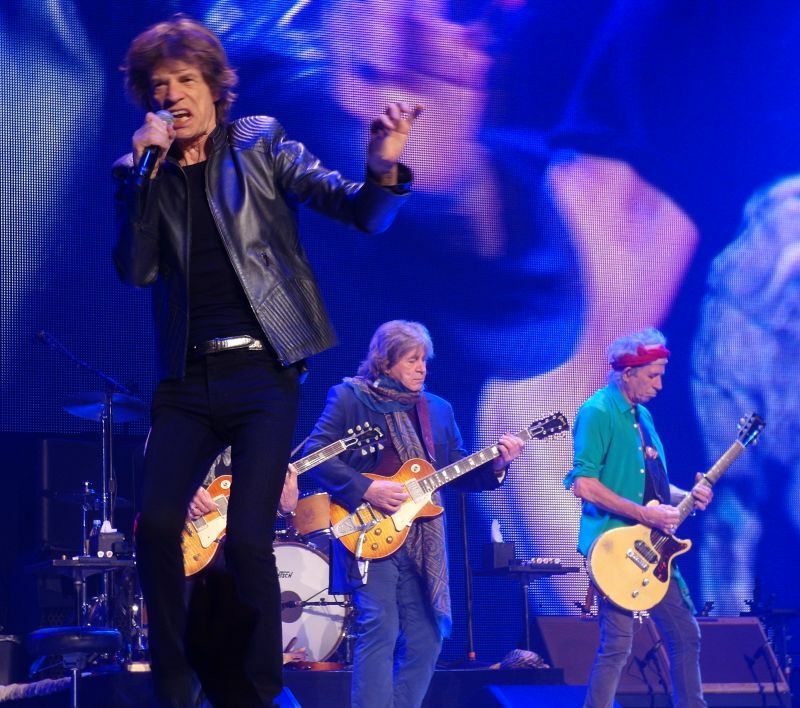 Just another minor touch that makes a Stones show unique, and Jagger a spontaneous and innovative showman. It is easy beat to death the old complaint about how the setlist does not change that much from show to show, but on a night like this it really does not matter; the high points were so high, the unique parts so memorable, and the band playing so well even an expensive ticket seems like a bargain. If you thought the Rolling Stones could not get any better or raise the level of their performance higher, it has indeed happened. Get to Washington DC Monday while you still can.